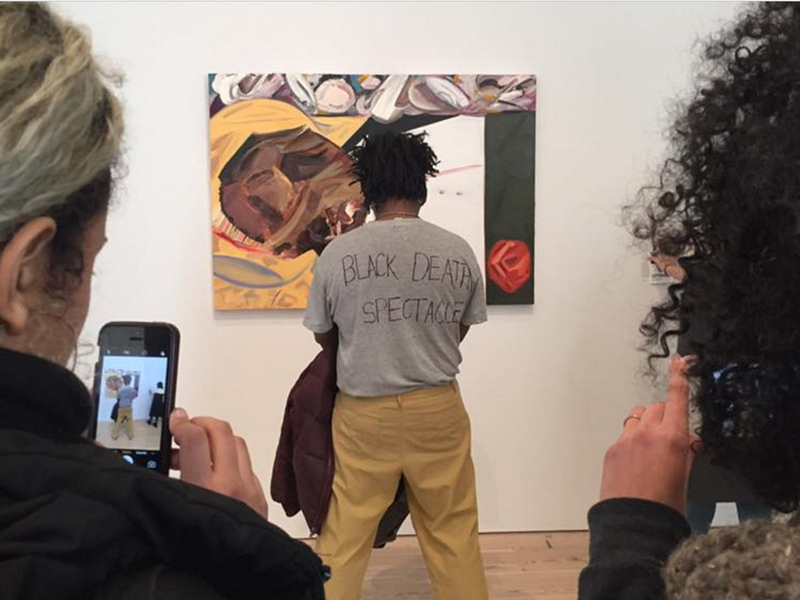 Parker Bright protesting Dana Schutz’ painting of Emmett Till at the Whitney. Image courtesy of @hei_scott Twitter. The artist roster of the 2017 Whitney Biennial is one of the most ethnically diverse in the event’s history (or really in the history of any biennial at a major art institution) but it is a painting by a white woman that is receiving the most attention in the show and has quickly become the controversial jump-off point for a conversation about free speech and the white commodification of black suffering. 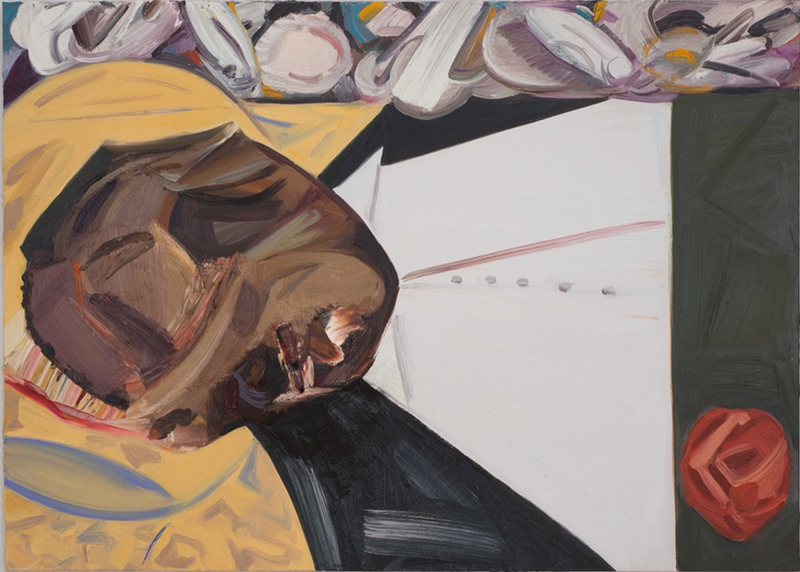 The painting in question, Open Casket by Dana Schutz is a representation of black teenager, Emmett Till. In 1955, Till was kidnapped, brutally beaten, fatally shot and dumped in the Tallahatchie River by two white men in Mississippi, who were later acquitted by an all-white jury. The lynching occurred after Till supposedly catcalled and made an advance towards Carolyn Bryant, a white woman (in 2007 Bryant confessed that she fabricated parts of her testimony). Till’s body was discovered after his death and was disfigured to the point that it was almost unrecognizable. Dana Schutz, Open Casket, 2016. Collection of the artist ; Pretzel Gallery, New York and Contemporary Fine Arts, Berlin. Photograph by Bill Orcutt. Courtesy of the Whitney Museum of American Art. Peaceful protest has always been a way of expressing dissent. As we’ve seen with the Black Lives Matter movement and The Women’s March on Washington, often public demonstrations of dissent do wonders to bring visibility to deep-rooted issues. While the Whitney will not be taking down Schutz’ painting, Bright’s public demonstration did lead to a conversation with Whitney curators, Christopher Y. Lew and Mia Locks and the museum is now sponsoring public discussions about the issues surrounding Open Casket. However Black’s call for the painting’s demise is an attack on artistic free speech that would set a dangerous precedent and undercut the entire purpose of art institutions. Why should a contemporary museum exist if it isn’t showing art that educates, that provokes, that sparks difficult conversations? Underlying the entire debate is the idea of ownership – who owns the suffering of any group of people and what is the line between exploitation and exposure? In the case of the Whitney, yes, it would have been safer if the artist of Open Casket was black but the subject matter would not have been any easier to swallow. And yes, the Whitney does cater do a mostly white audience (high admission prices are a huge factor of this) but as such, isn’t it even more important to show work that surrounds issues that many in certain social and economic groups may not be aware of? As a child growing up in North Carolina, my public school classes were filled with history lessons about slavery, Jim Crow, and the Civil Rights Movement. We learned about Emmett Till. This history followed me home and was discussed by both my white mother and black father. I thought that these lessons were a default component of growing up in America. However, I’ve recently realized that many of my artist friends were unaware of Emmett Till – until now. How many people are there who visited the Whitney Biennial and now know about Emmett Till but had no idea who he was before? Today’s social crusaders and devout defenders of political correctness need to choose their battles more strategically. Instead of attacking and censoring your allies, educate them. Channel your energy towards battling the people who are actually against you (head’s up – it’s not the art world). Emmett Till’s mother, Mamie Elizabeth Till-Mobley, insisted on an open casket funeral for her son in order to expose the brutality of his murder so that people would be made aware of the racist violence and deep-seated injustice occurring in the South. The subsequent exposure of his funeral became a rallying moment for the Civil Rights Movement. Look at another art form, music. If musicians followed Hannah Black’s assertion we wouldn’t have many of the rallying works of the past. “Strange Fruit,” the beautiful Billie Holiday ballad used a haunting melody to expose the horrors of lynching to the masses, it was written by a Jewish man. So was Bob Dylan’s activist anthem, “Blowin In the Wind.” In fact, Sam Cook was partly inspired to write “A Change Is Gonna Come” because he recognized the importance of Dylan’s “Blowin In the Wind” but wished it was written by a black artist. Art is cyclical, artists feed off of each other. If a painting by a white woman continues Till-Mobley’s mission by sharing the story of her son with the wealthy museum-going elite then so be it – that’s still more exposure, more education, more bodies for the cause. It’s a chance to have a difficult but constructive conversation versus a closed door and a missed opportunity. A social movement succeeds when its members outnumber the opposition. Look at today’s feminism – if it eclipses the success of past waves it will be because it is based on intersectionality and inclusion of all genders and races. The secondary motto of Black Lives Matter is “white silence equals violence” so why are we shunning those who are trying to speak up? The debate surrounding Open Casket will start off a public conversation at the Whitney Museum. “Perspectives on Race and Representation: An Evening with the Racial Imaginary Institute” will be held on April 9th at 7:30. Get more information here.